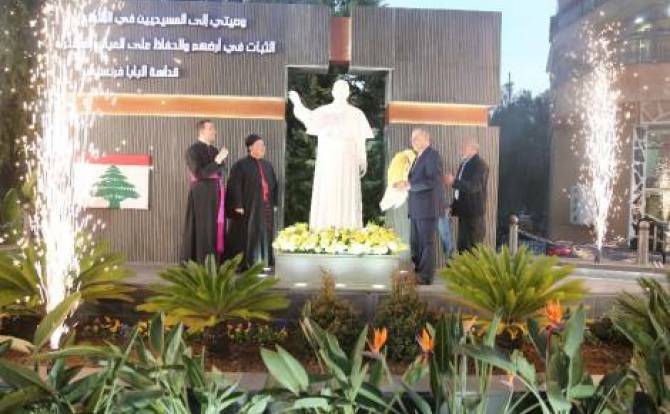 Hadath – The first statue dedicated to Pope Francis in Lebanon and throughout the Middle East was inaugurated in Hadath, municipality of the district of Baabda, considered part of the southern suburbs of the capital Beirut. The initiative, sponsored by mayor George Aoun, wants to be a sign to encourage local Christians on the importance and fruitfulness of the presence in the Middle East, in the sign of coexistence with the different religious communities and in the horizon of a common citizenship. The inauguration of the statue – which was presented by the speakers as the first dedicated to Pope Francis throughout the Middle East – took place in the presence of political and religious authorities on Wednesday, March 14, the day following the fifth anniversary of the papal election of Jorge Mario Bergoglio. During the event, those present were able to listen to some speeches proposed also by Maronite Archbishop Boulos Matar and by Msgr. Ivan Santus, secretary of the Apostolic Nunciature in Beirut. Sheikh Khalil Rizk, responsible for the foreign relations of the Shiite Hezbollah party, also took part in the event. Local sources, contacted by Agenzia Fides, point out that the aim of the event must be understood in the light of the problems that have recently put to the test social and inter-religious coexistence in the area of Hadath. In that area there is a growing real estate activism by members of the Shiite community, who aim to confiscate land and property belonging to Maronite Christian families. It is no coincidence – the sources contacted by Fides point out – the writing that appears near the statue of Pope Francis reports the words with which the reigning Pontiff invited Middle Eastern Christians to stay in the lands where they were born, to confess their faith in Christ and to offer in his name their contribution to peaceful coexistence throughout the Middle East. Periodically, confessional clashes arise around the control of land and real estate in Lebanon. In autumn 2013, a pressing call to curb the improper use of land belonging to Christians to build houses for Muslims was launched by Talal al-Doueihy, leader of the Movement “Lebanese Land, our Land” (see Fides 15/10/2013). The appeal in particular denounced the case of Al- Qaa, a Christian village near Baalbek in the area where large tracts of land had been bought by Muslims – Shiites and Sunnis – as agricultural land, only to be allocated to the building of housing estates to be sold to Lebanese and Syrian refugees belonging to their own religious community.